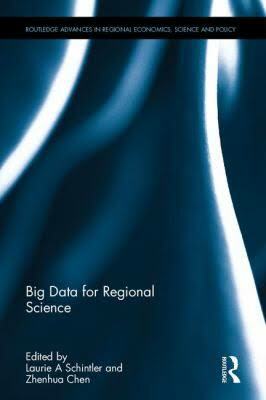 In the recently published book "Big Data for Regional Science" edited by Laurie Schintler and Zhenhua Chen, Nick Malleson, Sarah Wise, and Alison Heppenstall and myself have a chapter entitled: Big Data, Agents and the City. In the chapter we discuss how big data can be used with respect to building more powerful agent-based models. Specifically how data from say social media could be used to inform agents behaviors and their dynamics; along with helping with the calibration and validation of such models with a emphasis on urban systems. Below you can read the abstract of the chapter, see some of the figures we used to support our discussion, along with the full reference and a pdf proof of the chapter. As always any thoughts or comments are welcome. Big Data (BD) offers researchers the scope to simulate population behavior through vastly more powerful Agent Based Models (ABMs), presenting exciting opportunities in the design and appraisal of policies and plans. Agent-based simulations capture system richness by representing micro-level agent choices and their dynamic interactions. They aid analysis of the processes which drive emergent population level phenomena, their change in the future, and their response to interventions. The potential of ABMs has led to a major increase in applications, yet models are limited in that the individual-level data required for robust, reliable calibration are often only available in aggregate form. New (‘big’) sources of data offer a wealth of information about the behavior (e.g. movements, actions, decisions) of individuals. By building ABMs with BD, it is possible to simulate society across many application areas, providing insight into the behavior, interactions, and wider social processes that drive urban systems. This chapter will discuss, in context of urban simulation, how BD can unlock the potential of ABMs, and how ABMs can leverage real value from BD. In particular, we will focus on how BD can improve an agent’s abstract behavioral representation and suggest how combining these approaches can both reveal new insights into urban simulation, and also address some of the most pressing issues in agent-based modeling; particularly those of calibration and validation. Keywords: Agent-based models, Big Data, Emergence, Cities. 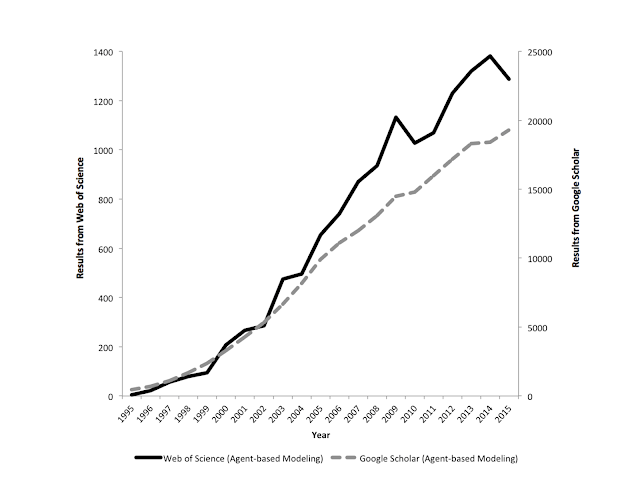 The growth in Agent-based modeling -from search results of Web of Science and Google Scholar. 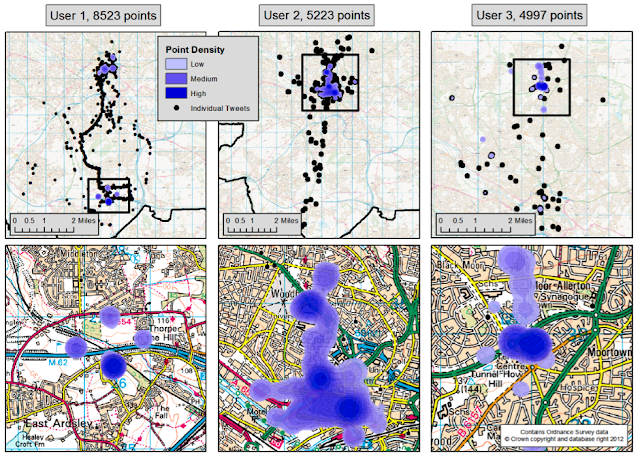 Hotspots of activity of Tweeter Users: Tweet locations and associated densities for a selection of prolific users.